Here is a wonderful mysterious place, a small formation of stones quite close to the Nine Maidens of Boskednan. Here we are deep in the sacred atmosphere of Cornwall. 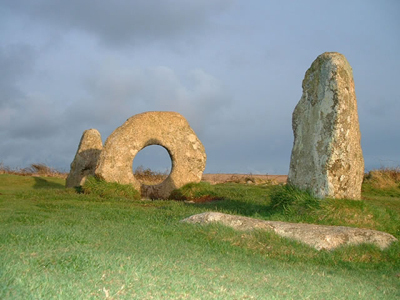 Two standing stones are either side of a central round stone with a hole in its middle so that viewed from one aspect it forms a three dimensional 1 0 1 feature. The circular hole is 0.5 metres in diameter and the only other known surviving holed stone in Cornwall is the Tolmen holed stone near Helston. Close to Men-an-Tol there is evidence of stones and cairns and mounds suggesting that perhaps this site was once part of a stone circle. It is dated as late Neolithic or early Bronze Age. In a drawing from 1749 the stones appeared to be not in a line like they are today but by 1864 they were drawn as they are seen now. As you would imagine there are plenty of traditions around such magical stones – women passing through the hole will become pregnant, children will be cured of rickets, it is able to reverse bad spells. There is a fairy guardian presence who assists the healing energies felt here and the local farmers cut the surrounding vegetation at certain times of the year. Otherwise, when the gorse is grown up it can be difficult to find these stones.